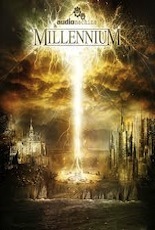 The first release of 2013 from Audiomachine will be the phenomenal “Millennium”. I was brought on this project by Paul Dinletir and Kevin Rix. Kevin composed this release in it’s entirety, and he just killed it. What an amazing humble talent this composer is. The depth and power of this record is something to behold. This was a very personal project for Kevin. He and Paul chose to record the Sydney Philharmonic at Trackdown Scoring Stage in Sydney Australia. As we were in the middle of putting the final touches on another project at that time, we went ‘new school’ with this one and communicated with Sydney thru Source Connect and had multiple feeds directly to Paul’s private studio. Right away the crew in Sydney adapted to my somewhat unorthodox methodology and were very accommodating. The symphony played great, Kevin’s compositions were great, the choir sang great. It was amazing all around. Of course being in a studio in Malibu overlooking the Pacific Ocean’s magnificent view was not so bad either. Hanging out with all the Audiomachine guys for this remote recording was a wonderful experience. I began developing this philosophy on producing and mixing that I started to realize on this release…….I have been using this methodology for years, but now I call it “Finding the Power Center”. Sounds simple enough, however in practice it takes an intuitive approach. When I mix trailers, movies or records, way more than making a piece sound great in the end, I first look at “What makes this piece special or unique?” or “What makes this piece important and powerful?” If I don’t hear something special I will design or develop one that is. This is where the experience of mixing a boatload of music comes in. I look for this “Power Center” and exploit it. There is no exact science here, it’s mainly a sense I have based on what I believe the composer is saying musically. Each and every bar in trailer music has to mean something to me. If a sound or part is obscuring the focus of what I believe the artist is trying to convey, I will either treat that part in a way to give space for what I think is important, or I will do away with the part altogether by “Putting it in the cornfield” as I call it. So when I am building a piece for an artist, I am always thinking of what I want the audience to hear or feel. I put up each track and form a comparison in my mind; should this lead the pack in a section, or become more of a supporting role? Each and every day I get handed these 200-300 track wide Rubik’s Cubes that I have to solve, sometimes by creating and designing, sometimes by relying on technical craft. There is no utopian world, no, ‘One way works best’ or ‘Its the same style, I will just mix it the way I did last time’. There is however, a definitive path in conceptualizing a piece of music that presents itself only after I put aside conventionality and allow the music to tell me how far I can explore. This intuitive vision is to me what the artistry of mixing or producing represents at its essence.